If you want the ultimate healthy food, abundantly available, high in protein, low in fat and cholesterol, cheap to produce, then look no further than bugs. We have a mental block when it comes to eating bugs, though. Worms, of course, fall into that category. They are not, strictly speaking, bugs, but I do classify them into the category of foodstuffs that have the ‘eww’ factor. When I first heard about something called the ‘Diet of Worms’, when I was at high school, I did imagine that it was some kind of unpleasant meal. It took me some time to realize that, in fact, a ‘diet’ was a term for a German legislative assembly and that ‘worms’ was in fact a city in Germany, pronounced ‘Verms’. The Holy Roman Empire – the material successor to the Western half of the old Roman empire – was inextricably linked with the Papacy and it held vast amounts of territory (pictured in color below). It was the secular imperial wing of the Papacy, if you will. By the sixteenth century, it was being assailed by all sorts of challenges, chief among them the theological awakening which we now call ‘The Reformation’. If there is one person that, in a sense, embodies The Reformation, it is a Roman Catholic monk in Germany called Martin Luther. It is no coincidence that the Reverend Michael King, Sr., decided to change both his own given name, and that of his son, Michael Jr. to 'Martin Luther' in the 1930s. The sixteenth century Martin Luther, a Roman Catholic monk and professor of theology had, while immersed in Catholicism, become acutely aware of the fact that his mother religion had become bloated, corrupt and detached from the way that God would want it to be. In 1517, exasperated with the situation, he compiled a list of 95 problems that needed to be addressed, and he nailed them to the door of the church in Wittenberg, Germany, where he lived. This, as you may recall from your history lessons, got him into quite a lot of trouble. In 1521, Luther was summoned to an imperial tribunal to answer accusations that he was corrupting the Roman Catholic church with his upstart behavior. This tribunal was held in the German city of Worms, and since this is the term given to an imperial tribunal, this was in fact the famous ‘Diet of Worms’. Surrounded by the great and the good of the Roman Catholic church, Martin Luther was asked to give an account of himself. 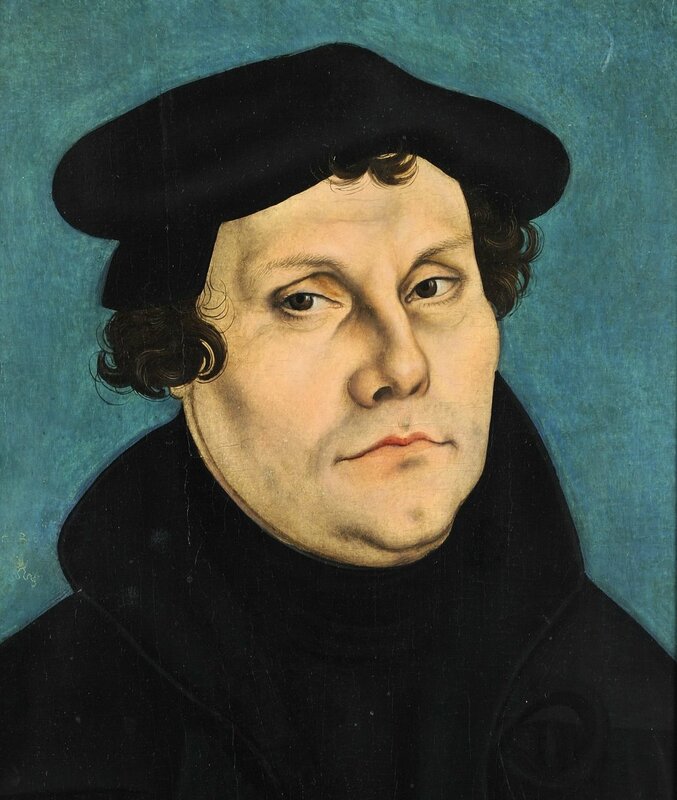 Luther stuck to his guns and refused to back down on his critique of the Roman Catholic church. In the end, he summed up his position in what has become one of the most famous quotes of that entire period of history. In our first reading today, we have an account of two strong-willed men arrested and brought before the ruling religious authorities of the day. They are accused of breaking the rules of their religion; essentially, of heretical behavior. What was their crime? They had been in the Temple precincts in Jerusalem. Fair enough, they were Jews, after all. And they had seen a man there who had lost the use of his legs. They felt that the right thing to do would be to help this man, and that God would want him to be able to walk again, so they healed him through the power of the Holy Spirit. This was an unambiguously good and kind thing to do. It made the crippled man very happy, and it enabled him to live life much more to the full. These two men were Peter and John. We first knew them as disciples of Jesus and, now, after the resurrection, we know them as ‘apostles’. ‘Apostle’ simply means, in Greek, ‘one sent out’. In other words, they were people who had heard and seen the good news of Jesus Christ and were now being sent out to spread that good news. They were still Jews, but they were Jews who had recognized in Jesus the Messiah. Their mission was to change the course of Judaism to accept the reality of Jesus. As we know, they failed in that aim, but they more than succeeded in spreading the good news of Christ. They wanted to reform the Jewish religion to accept this new reality but they found, instead, hostility at every turn. Fifteen hundred years later, Martin Luther would find exactly the same thing. I find the parallels between Luther at the Diet of Worms, and Peter and John before the Chief Priest and his associates, strikingly similar, which is why I decided to open this sermon by talking about the Diet of Worms. In particular, I was struck by the manner of inquisition, and the final position taken by Luther: “Here I stand; I can do no other”. For me, that seems such a strong parallel to Peter’s words to the Sanhedrin (the formal name for the Jewish ruling council that they had been hauled in front of). If Peter had, in fact, said, “Here I stand, I can do no other”, we would have found it entirely consistent. Basically, this is what Peter is saying. “We healed this man”, he says, “because it was a good and kind thing to do”. This man couldn’t walk. And now he can. What’s not to like? If something is clearly and unambiguously good, like restoring health to someone, then it must be from God. For some reason, the Jewish religious authorities of the time had lost sight of this. Peter and John had not followed all the prescribed rules of Judaism and, to the authorities, this was more important than the fact that something good had been done. Or, to put it another way, fulfilling the letter of the law had become more important than fulfilling the spirit of the law. For Martin Luther, the same was true. His biggest problem was to do with a practice called ‘indulgences’. This was an extraordinary practice, whereby you could, basically, make a payment to the Church and, a bit like a taxable deduction, you would get a reduction in the amount of time you would need to spend in Purgatory. It was a kind of ‘Get Out of Jail Free’ card. If you didn’t have the money to buy your time out of Purgatory, tough luck. Martin Luther saw this as unambiguously wrong. As do we, I hope. If it walks like a duck…. And this is the point, really. If it walks like a duck, and talks like a duck, what it in fact is, is…..
We know (perhaps better than we give ourselves credit for) if something is unambiguously right and good. Similarly, we know if something is unambiguously wrong. There are all sorts of ways in which vested interests, or willful moral blindness, or any number of other things, can stop us recognizing that something is unambiguously good, or not good. Think of something that is good and right, but which we ignore as such. Think of something which we justify but is, if truth be told, contrary to what God would really want. Let’s be like Peter and John and Martin Luther. Prepared to make a stand before the authorities and say, “Here I stand. I can do no other”.